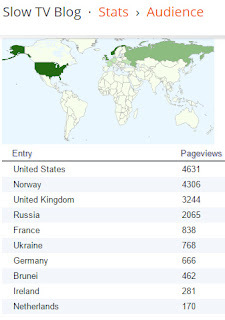 The Slow TV Blog: Which countries seem the most interested in Slow TV? Which countries seem the most interested in Slow TV? Dear blog readers and visitors - thankyou for making 2015 a great year on the Slow TV blog! Have just pushed through the 22,000 unique page views mark today (31st December 2015). In the next few days I'll bring my review of the BBC's All Aboard! The Sleigh Ride, a summary of Slow TV in 2015 and what we might look forward to in 2016 for us Slow TV lovers. 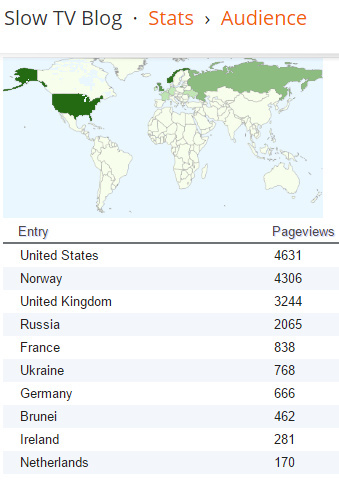 Which countries have been the most interested in Slow TV according to the Slow TV blog's hit counter? In 10th place is The Netherlands. Not yet produced any of their own Slow TV productions but I have been contacted by an intern for a Dutch production company and two undergraduates studying Slow TV from different universities in The Netherlands. In 9th place is Ireland; not able to explain that one directly. Maybe by virtue of shared interest with the British Isles. In 8th place is Brunei - and this only in the last month. What is happening in Brunei to give such a surge of interest in Slow TV? Please let me know - I've had a dig around but can't explain that one. In 7th place with a beastly 666 views is Germany. ARD Alpha did some Slow TV earlier in 2015 and coupled with a steady interest in the subject, I expect will remain a steady source of hits. In 6th place is the Ukraine. Again, a slightly puzzling source of hits; even before Russia's War and Peace Slow TV in December, The Ukraine gave a steady source of interest in Slow TV. In 5th place is France; what with a prerecorded Slow TV by the French (The Tokyo Reverse) this may explain a consistent steady level of interest from France. Vive La France! In 4th is Russia, which blasted up the hits counter from November through December - the marathon live read through of War and Peace mainly responsible. More on that in the next couple days. In 3rd is good Ol' Blighty, the UK. With several Slow TV productions during 2015 on BBC4 we can assume there will be more to come. Coupled with BBC Research and Development having some discussions with me about Slow TV, it is something I know ought to happen much more. In 2nd place, is Norway - the motherland of Slow TV as we know it since 2009. I know about 1/3 of the Norwegian tally comes from one solitary link on the NRK website, so it probably ties with the UK in second place. Knowing that NRK have years of Slow TV planned, our friends in Norway will continue to find the Slow TV blog. In 1st place is the USA. The most accelerated editing paced nation in the world is the most interested in a reduced editing pace format - real time - which is the essence of Slow TV. Hopefully 2016 will see the go ahead and broadcast of a Norwegian format USA Slow TV broadcast which will celebrate 12 hours of an (iconic?) American road journey, in Slow Road Live. Thanks for visiting the Slow TV blog in 2015 - keep coming back for more in 2016. Should be four new posts in the first week of 2016 alone, with more exciting news from the Slow TV blog as the year progresses. Happy Slow TV New Year from me, Tim Prevett, at The Slow TV blog.